This colorful swallow pattern Talavera salsa bowl is perfect for your next dinner party and southwest kitchen d�cor. 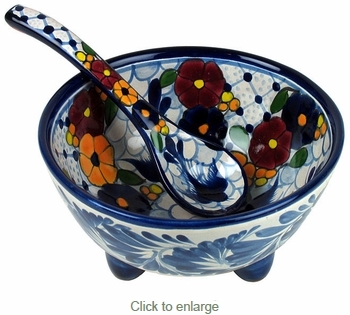 Our Mexican Talavera salsa bowl and spoon are lead-free, safe for serving food and dishwasher and oven safe. All of our Mexican Talavera dishes and serving pieces are handmade and hand painted by Mexico's talented potters.